European Satellite TV System Why TV Services? If you are experiencing Freezing Pictures or No Signal on your digital TV service or if you have no TV pictures our technicians can perform a TV Aerial or Satellite repair at your property, and get your TV channels working again! Our engineer will call to your property and perform a FULL diagnosis of your digital TV viewing system. Once the fault has been found, we will endeavor to rectify your television viewing system to receive the best signal possible. We offer a Same Day Service where possible for all Aerial or Satellite TV Repairs! Our fully equipped mobile vehicles have every tool and equipment needed to get your aerial or satellite system working again. Should you require additional equipment, such as a signal booster or an upgrade to your existing system to improve reception levels, all of which can be completed during the same visit! TV Services engineers are trained to repair your existing aerial or satellite system and get your digital reception to optimum viewing levels. If you are looking for one extra television point, or a fully installed digital multiroom system, TV Services can help create a solution for you. Using digital signal amplifiers, we can fully configure your home or place of work to provide instant access to digital television viewing services such as Sky, Freesat, Saorview or European Satellite TV from any room. Just call us on 09096 34939 and we would be happy to arrange this for you. If you are an existing Sky Digital TV customer why not add a Free to Air point as that extra point (or connections to extra rooms). With no monthly subscription you can enjoy all the benefits of the Free to Air digital TV system for a once off cost. No more arguing over who has control of the television again! Multiroom, is a fantastic way to watch digital television in your bedroom (or any room of your home) all whilst controlling your Sky, Freesat, or DVD system in your living room! Every Multiroom system is different, and can be designed and to meet your requirements, and configured to operate through as many rooms or televisions of your choice. If you are looking for one extra television point, or a fully installed digital multiroom system, TV Services can help create a solution for you. Using digital signal amplifiers, we can fully configure your home or place of work to provide instant access to digital television viewing services such as Sky, Freesat, RTE or European Satellite TV from any room of your home. Using infrared emitters, you can control Sky, Free to Air, Freesat, Digital TV Channels, DAB/FM Radio & even your DVD player from any room! Furthermore you will be able to watch individual digital channels in different rooms at the same time. A multiroom system will put an end to the fighting over who has the TV remote control! Each multiroom home distribution installation can be custom built and discreetly installed to your specification. . If you have a European satellite television system and you are having reception issues, or you are not receiving the TV channels you would like, we can provide a complete service of your system. One of our engineers can call to your property and check your entire satellite TV installation, including cabling and the setup of your receiver, and by using a spectrum analyzer, ensure the satellite dish is correctly aligned and receiving the maximum signal possible. TV Services can also re-align your dish to a different satellite if you wish to receive a different selection of channels and languages. TV Services are specialists at supplying and installing a range of satellite TV systems, capable of receiving European satellite TV, We can design any satellite TV system to receive a variety of channels and in channels, such as; Spanish, Portuguese, Polish, Russian, French, German, Italian, Arabic, and many more! Satellite Dish Aligned using the latest Digital Signal Meter - Great Reception guaranteed! If you are looking to have your new digital LCD or Plasma Television installed, or removed if you are moving home, we can help. We have years of experience of home digital systems, TV Services can even provide additional services such as the installation of an Saorview compatible aerial to compliment your televisions digital capability...or even a HIGH DEFINITION system from Freesat or Sky to take advantage of the latest in home entertainment technology! Without expert LCD or Plasma TV installation, you may not be maximizing the viewing potential and also have problems with your installation! TV Services can fully install any Plasma Screen or LCD digital television and ensure all your home entertainment systems are fully configured to operate correctly, whether it is Saorview, Sky, Freesat or your DVD/VHS system. Our Engineers will install your LCD or Plasma digital TV using suitable wall mountings and cable routing to your entertainments systems, video & DVD players. TV Services can also supply the suitable wall bracket and cabling for your Plasma or LCD tv system, and an engineer can visit to discuss the viewing area and plan the installation with you before we undertake the works. TV Services can also provide quotations for any digital system upgrades to take full advantage of the new technologies digital television brings, such as HD High Definition from Freesat or Sky, and Saorview. Please ring us on 0872362881 to arrange the upgrade of your digital television system to complement this. If you are looking to receive a wide variety of European and Middle Eastern digital TV channels and languages then a fully installed digital motorized satellite dish or receiver system is your answer! The benefit of the motorized system is that the digital satellite receiver can be programmed to receive digital signal from many satellites in orbit, it will automatically re-position the dish to the pre-programmed locations and receive the new digital TV channels. There are thousands of free digital channels available, providing a vast variety of entertainment in many different languages. There are also premium subscription channels, and encrypted channels which require a decryption card. Please note, you will require a receiver with CAM access for these channels to be unlocked. TV Services can also install digital CCTV in and around your property. The digital CCTV camera’s can be integrated into the home distribution system allowing you access from any television to view the surrounds of your property. 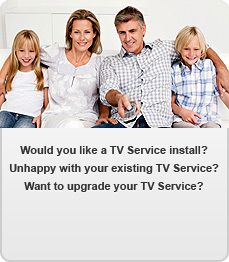 All TV Services Satellite and Digital TV Installers Have A Minimum of 5 Years Experience. Your Local Satellite and Digital TV Installers, With In-depth Knowledge of Your Area. Full Public Liability Insurances & Guarantees. Quality Materials & Tools To Ensure The BEST Satellite and Digital TV installations and service. TV Services providing your local satellite and digital TV, Sky, Saorview, Free to Air & Freesat...covering Galway, Westmeath, Offaly & Roscommon.